Mix the bread mix according to packet instructions. Form a ball and then flatten in out into a small disc. Roll it out into a pizza base. Spread pizza sauce over the base and top with grated cheese. Steam Chinese sausage and silverbeet for 6-8 minutes until succulent (the sausage) and wilted (the silverbeet). The sausage will need longer than the spinach. Arrange silverbeet on top of pizza as you desire. Slice Chinese sausage and dot evenly over the pizza. Bake in a moderate oven (180 degrees Celcius) for around twenty minutes until base is crisp and toppings are browning nicely. If this isn’t a perfect example of fusion food, I don’t know what is. I came home yesterday to find that Mr Hungry Australian had made this Italian-Chinese pizza. I was quietly appalled. It just seemed so wrong. Slightly disturbing even. But then I tasted it. And as I silently chewed, I made a mental footnote to encourage him to cook more. Why has no one ever thought of this combination before?!!!! 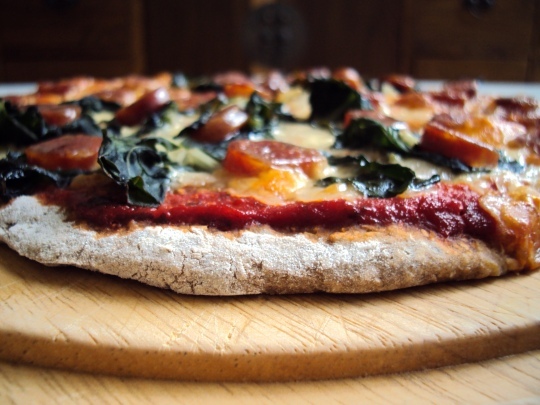 The salty Chinese sausage went superbly with the silverbeet, pizza sauce and cheese. Moreover, the pizza reminded me of my favourite spinach and cheese pasty, which is also made with a wholemeal dough. It was absolutely delicious. In fact, it was so good we had to make it again for lunch today. And I can’t guarantee we’re not going to make it again for lunch tomorrow. So go on. Try it yourself.